Summary: This is a very popular and effective waterbrush. It's made by Pentel but is now also available via Derwent and Derwent retailers. It's repackaged with the Derwent name on the packaging. Derwent B&M retailers - if they've chosen to stock them. Derwent now have a small Waterbrush. When I was sent a sample to try I looked at it and was very puzzled. I had to go and get my existing waterbrush to check it out - you can see the photo above. They were exactly the same! I asked Derwent about this and it turns out that Derwent is now repackaging the very popular and very efficient Aquabrush/waterbrush made by Pentel - which isn't always very easy to find in art materials shops. 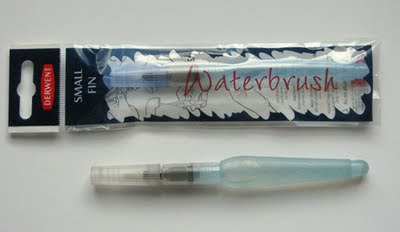 Derwent have sold the medium size waterbrush for some time but are now also selling the small/fin waterbrush which is suitable for more detailed work as well. So that's good news! Basically this is a tool which has a nylon brush on one end (with a cover) and a transparent plastic barrel sitting behind it. It works very like a conventional pen - hence the name brush pen. There's a one-way valve which allows water through to thr brush when there is pressure on the end of the brush. Squeezing the flexible barrel increases the flow - and you can squeeze out drops if you try hard! You need to give the brush a good 'wash' in warm water before using it for the first time. I'd also be very wary of using it with inks which you shouldn't put in conventional pens - like Indian ink. Essentially you don't want to use it with anything which when dry will stop the valve from working or refuse to budge from the inside of the barrel! 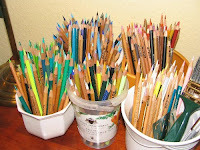 This is a tool which is very useful for those who sketch and those who use watercolour pencils. I was sat on a tube when I dried my waterbrush out for the first time! 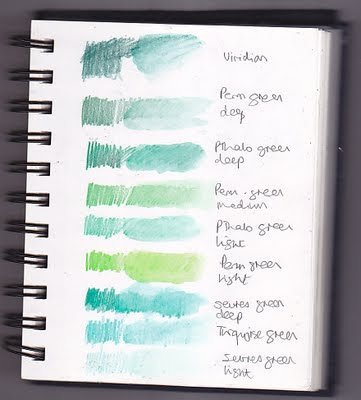 This is a page of my Talens watercolour pencils on a sheet of Winsor & Newton heavy weight (80lb) sketchbook. I think I probably need to do a review at some point of all the different brands of watercolour pencils when used with this brush! Tim Fisher has produced a very helpful video about watercolour pencil techniques in which this brush features which has been posted on YouTube by Jacksonstops (who I think might be Tim - it's not obvious from YouTube). See this post on Making A Mark - Watercolour pencil techniques. The differences in cost between different suppliers are not very significant. For most people it's going to boil down to whether you prefer to buy your supplies at your local art shop or online and which retailer you usually use! I can confidently state that if this is a product which you like, you'll find yourself using it a lot and will probably want more than one - especially you want dilute solutions of water-based medium in the barrel - and that's when cost will be of more relevance. Russ Stutler who provides a review of waterbrushes that he uses on his sketchbook site. It's very detailed and it's by somebody who has been using watbrushes for years. Synopsis: The first work to treat the art of the whole world from prehistory to the present day through the extensive use of maps. It places an emphasis on art as a visual expression of the story of different cultures at different times. Covering painting, sculpture and architecture as well as other arts and artefacts, The Art Atlas provides an entirely new vision of the history of the world's art by showing how physical and political geography has shaped its developments. Who should buy this? : Art Historians and teachers and students of art history. People (like me) who love art AND maps. Who should not buy this? Those with no interest in art history or how art has developed over time and in different cultures. People who don't like maps and/or cannot read a map. Maps showing how art flowed between towns, countries and cultures. Not a book you are ever going to digest in a hurry! Summary: This is a large tome for people who want to get to grips with a geographical and cultural overview of how art has developed across cultures, countries and over time. What I like about the book is that it does try to embrace all of art. What makes it unsatisfactory is that in so doing it inevitably has to skim across the surface of some of the artists and aspects of art with which we might be more familiar. In doing this it made me realise just how much I didn't know! Which, as I indicated earlier, means I can see this book being around as a reference book for some years to come. I recommend people read what interests them and then see where that takes them. This is a summary of my comprehensive book review posted on Making A Mark earlier this year. See Book review: The Art Atlas for more information and detail about this book. What I have how ever grasped is that this book appeals to the geographer in me (all those maps - heaven!) and that it tries to get to grips with explaining the flows between different parts of the world at different times in world history in visual terms. Thus it conceptualises art as a global phenomenon rather than something which is totally discrete and tidy (like "European Art") which is often the way art history can tend to be presented at times - even if this can be rather inaccurate. Professor John Onians, BA, PhD, FSA. specialises in architecture, especially the architectural theory of the Italian Renaissance; painting, sculpture and architecture in Ancient Greece and Rome; material culture, metaphor and thought; perception and cognition, and the biological basis of art. His publications include Art and Thought in the Hellenistic Age (Thames & Hudson) and Bearers of Meaning. The Classical Orders in Antiquity, the Middle Ages and the Renaissance (Cambridge University Press, 1988), which was awarded the Sir Banister Fletcher Prize in 1989. He is also the founding editor, in 1978, of the prestigious journal Art History. 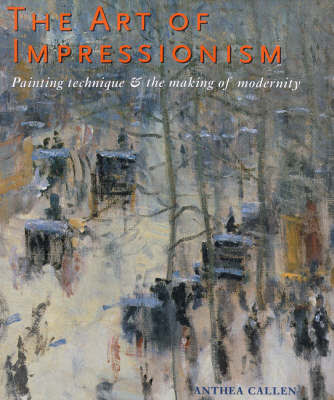 Synopsis: This magnificent book is the first full-scale exploration of Impressionist technique. Focusing on the easel-painted work of Monet, Pissarro, Renoir, Cezanne, Cassatt, Morisot, Caillebotte, Sisley, and Degas in the period before 1900, it places their methods and materials in a historical perspective and evaluates their origins, novelty, and meanings within the visual formation of urban modernity. Browse the contents page here and here. people who aren't willing to search high and low for it! Summary / Recommendation: I highly recommend The Art of Impressionism: Painting Technique and the Making of Modernity for anybody who, like me, likes the work of Impressionist painters and is also fascinated by the preparation and process behind the making of their art. My purpose in posting is to update a post in February 2008 on my Making A Mark blog - The Art of Impressionism and associated painting techniques. Click the link to read my detailed book review - which is summarised above. The painting on the front cover is part of "Boulevard des Capucines" by Claude Monet painted in 1873.
on a 'horiziontal landscape no 25' canvas. This very worthwhile book is now out of print and apparently copies are difficult to locate. Personally I think it is a book which is well worth owning. However if you want to acquire a copy you need to buy it now or you might not be able to buy it at all. These are the libraries in the UK which have a copy. OR you could be paying very high prices on the Internet - Amazon for example has book sellers in the US quoting prices from $400-600+. In the UK it was originally priced at £45. Plus we also need to let publishers know which books need to be reprinted! I'm off to write a note to the Yale University Press! Note: Many thanks to Caroline Oakley, who's an Adult and Community Learning Tutor, who wrote to let me know that this book is now out of print. Technical Details: The tool is webware and can be used without downloading anything from the internet. There's an option to download Firefox browser extension (not tested). This is what it claims to do. Search for keywords in the images alt tag. 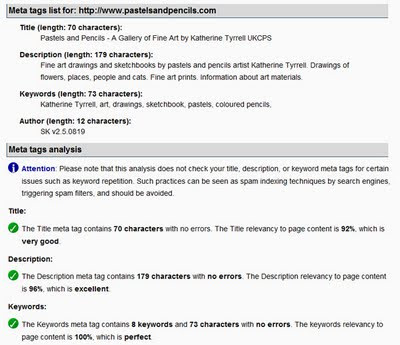 Summary: A useful tool for reviewing the titles, text and meta tags used for individual website pages. Identifies quickly and easily issues which might cause a site to fail to rank well in SEO terms. it's a bit too addictive - ration your time! This is a summary of Google SEO Ranking Factors with comments based on the SEOmoz survey of Search Engine Ranking factors v2. NOT going to tell you what your page rank is - but it will show you how you're messing up your chances of getting a good page rank. NOT going to tell you all the things you need to do - but will highlight some important things to address. This SEO Analysis Tool is to help you analyze and measure the ranking potential of your web pages. It doesn't only analyze the Meta Tags of your pages, rather it tries to use the same spider technology as the search engines spiders them self. Before you can get a link you first have to be found! This tool might improve the chances of a page being found as a result of a search due to the page being accurately described in a way which the Google bot and other spider bots like. All you have to do to use this tool is insert a URL for a website (for the home page) or any URL of any website page and that page will be analysed as to its SEO effectiveness. Then complete a quick spam check. On the right I've provided an example of a page. i'd like to just emphasise that this was after paying attention to the warning messages and tidying up my site description and meta tags. In general, I found it very helpful to focus in particular on the title tags and the description as that is where Google starts in its hypertext analysis. I've personally found it very helpful for reviewing the set-up of my information pages on Squidoo and the individual pages of my two main websites. The thing I liked best is that you could tweak a site, republish and then check to see what difference a change made - for better or worse. The one problem I identified while trying it out is that it is not at all helpful in analysing blogspot blogs. The website also provides some useful SEO tutorials in layman's language and general terms. Incidentally, one of the things I liked about SEO Workers was that they identified who they are - see About Us which lists names and provides pics, addresses, and contact details. Pay attention to Matt Cutts too! It also pays to review what Matt Cutts, the SEO GoogleMeister, has to say from time to time. he's got the most up to date perspective on what counts and what matters. Don't forget image search, videos, etc. Robust production values indicate this is a book which is not about to fall apart - which is very reassuring given the number of pages! Synopsis: Covers 700 artists in a 540 page chronological overview of the history of art relating to different cultures and the main periods of art history from prehistory to the present day. According to the author/editor, the purpose of this book is as straightforward as its "does-what-it-says-on-the-tin" title. Its aim is to open, to the general reader, a thousand doors into a thousand different experiences of art - and by doing so, to make the wold of the museum and art gallery, church and cloister, temple and mosque, both more enjoyable and more accessible. Summary: This is essentially a visual guide. The text is informative and succinct but does not provide an in-depth discussion of art in different periods. In 600+ pages, this book succeeds in giving a very good flavour of each art movement, art period, art culture and an awful lot of artists. It's a very good book for introducing people to art across the ages and different cultures. A primer for those wanting to learn more about the history of art and suitable for all students - young and old. 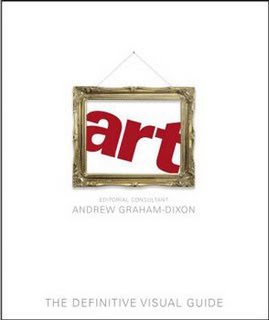 Andrew Graham Dixon suggests it can be used as a work of reference, a bluffer's crib or a guide and companion on a path to exploring art. Synopsis: Aspires to being a comprehensive guide to coloured pencils - but fails. Who should buy this? : People wanting to see examples of coloured pencil artwork by different artists. Who should not buy this? People new to coloured pencils who want to learn how to use them as a serious art medium. The book provides poor technical advice about tools and materials relevant to coloured pencils and only generic and very basic art advice. There are much better alternative books available. apparently written by somebody with little or no personal expertise in the use of coloured pencils. the techniques articulated by the artists who have provided artwork for the gallery are not reflected in the rest of the book. the chapter on Subjects recommends copying from 'copyright-free' stock photographs. The author appears to be unaware of UKCPS rules on use of photographs or the consequences for artists entering subsequent artwork in a coloured pencil society exhibition. Summary: The Coloured Pencil Artist's Drawing Bible has its merits, however it's far too generic to be of interest to those wanting to become serious coloured pencil artists. It was very disappointing to find serious weaknesses in the discussions of tools and materials and techniques for working in this media. It would have been nice to see a recognised expert in the use of coloured pencils commissioned to write a book like this. 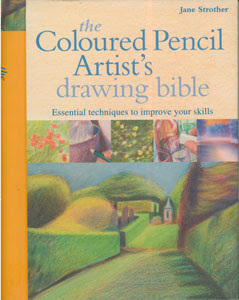 I do NOT recommend this as a book for those wanting to become coloured pencil artists. This is a summary of a book review which I did earlier this year. You can find my comprehensive book review here Book review: The Coloured Pencil Artist's drawing bible on Making A Mark. Below is the conclusion I reached after reading and reviewing this book. I'm not sure the publishers were clear what audience they were aiming at. If it was artists beginning to use coloured pencil then the book simply doesn't deliver in enough depth and as indicated above there are other books around which deliver better value for money. 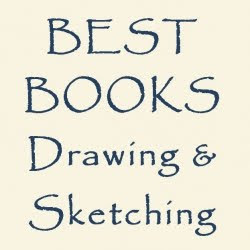 If it's people starting to draw then I guess it might explain the choice of author and the wealth of very generic material that it includes - but I can't help thinking such people would be more likely to buy any of the really good drawings books which are around. I'm afraid I can't recommend this book because of the serious weaknesses it displays in relation to the more technical aspects of drawing with coloured pencils and because there are much better books around which tackle the subjects covered in a more accurate and comprehensive way. I think it's a great pity that the artists whose work has been included in this book haven't had the quality of their work matched by the art instruction on offer. Below I've included links to sites where I do recommend books to those wanting to become coloured pencil artists. Plus a couple of comments on the type of book which these days is often missing from bookshelves devoted to art instruction. Making a Mark: What sort of art book is missing from our bookshelves?